My friend David and I are always talking about owning a weekender, not just a building, but some land as well. Somewhere we can escape the weekly grind, well for me lately that doesn't count, but you get my point. We talk of some land where we can have a little shack, some room for dirt bikes, a little dam for fish and generally just getting out there and relaxing and enjoying the outdoors abit. Nope this isn't mine, well it felt like a slice of paradise at times, and luckily I was lucky enough to grow up on this bit of land. Many a raft race was taken down this stretch and I believe we still have the devonport raft racing trophy here at Mum and Dad's somewhere. The tractor that always seemed to be flat and you would have to find another vehicle to jump start it. Run starting was never an option unless you were smart enough to park it on a very steep incline. I've always been an outdoors boy for working, I've never wanted to be inside and stuck behind a desk, not that there is anything wrong with that of course. I'm not expecting anything flash, you get what you pay for, but I like a challenge, no matter what it comes too, I think nothing comes easy. Even if it's like mostly bush, I'm up for the challenge of clearing a little of it and sowing it down with a little grass. So the question needs to be asked if you were to buy land, where would you buy? 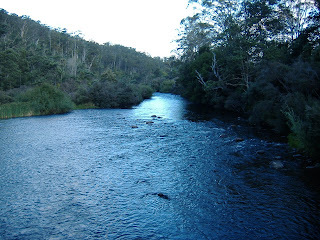 where is the best part of northern Tasmania? It's not a rhetorical question, I'd love to find out what you think, so comment me. Buy around there around where you grew up - somewhere near the water would be a little warmer. 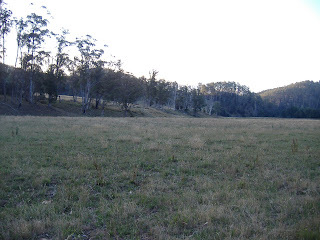 I really love the area around Latrobe- so beautiful any time of year. 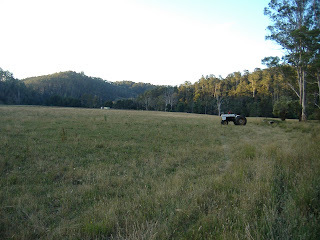 And even though I said Id never live further north west than Devonport ever again, i recently spent a night near Gunns Plains, and it was so so beautiful- so green and fresh. loved it!Its fun dreaming , huh, one day I want to oen some land too...mmm, if only money did grow on trees! Chrish... you are sounding more and more every day like you need to stay in TAssie!!! Dont go back to Sydney! You are looking much better too, all this lovely fresh Tassie air! When do you head back to Sydney??? ?